By now, most of us have seen Batman v Superman: Dawn of Justice. 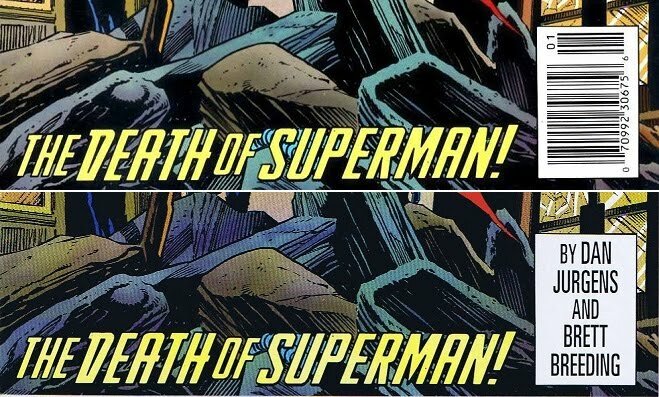 Whether you liked it or hated it, we do see the apparent death of Superman at the hands of Doomsday at the end of the film, and this is the comic that sees the untimely end of Superman. But, as with most comic book characters, he doesn't stay dead for long. 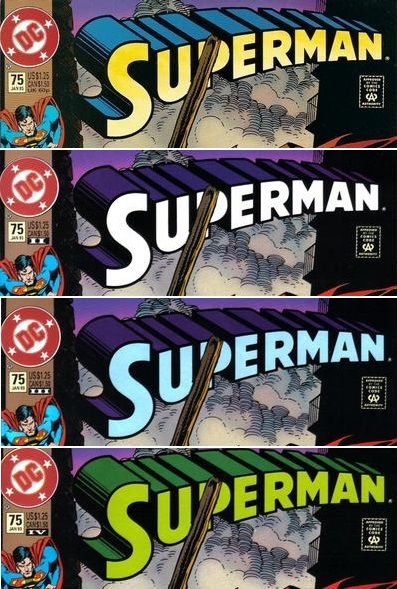 He would make is way back into comics a mere five months later in Adventures of Superman #500. When you read this comic, don't expect to find a story that has some deep meaning that is going to change your life. 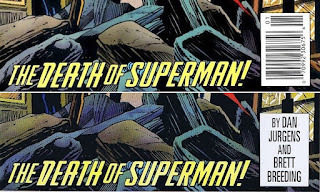 It's a straight up slug fest from beginning to end, and that's when we see both Supes and Doomsday lying in the rubble that used to be Metropolis. 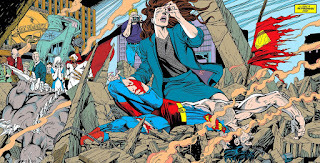 The creative team, that includes editor Mike Carlin and writers Dan Jurgens and Jerry Ordway, came up with the storyline after Carlin wondered what the world would be like without Superman. I personally think they did it as a gimick and to sell a s#!t load of comics. Well it worked, they sold a ton of 'em. So many that this comic went all the way up to a fourth printing. Let's talk about the differnt covers that this comic has. As I already mentioned, there were four total printings. So, that's four covers, plus the newsstand edition, and the two polybag editions. So that's seven total, not counting all of the various autographed copies, which I'm not going to get into. There are minimal, but very obvious differences between all of the direct and newsstand editions of this comic, mostly in the title. The fourth print has a green title. I've included the picture to the right for reference. There is also a first print newsstand edition of this comic. It's easily spotted by the UPC code in the lower right corner of the cover. These comics are a lot more rare than their direct market counterparts. It's estimated that only 10% - 15% of all comics printed around this time were the newsstand copies. So, if there were a million copies of this comic printed, then there are only 10,000 to 15,000 newsstand editions out there, which is significantly lower. These newsstand editions are starting to get noticed in the market, so if you're able to find a copy, there may have a chance of it gaining value better that the direct edition would. Also be on the lookout for the more popular polybagged editions. The first is the more abundant black polybagged edition. This is the bag that has the red Superman symbol that looks like is dripping blood. There were a lot of extra goodies packed into the bag with the comic in this one. 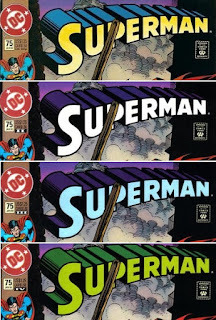 They called it the Superman Memorial Set. 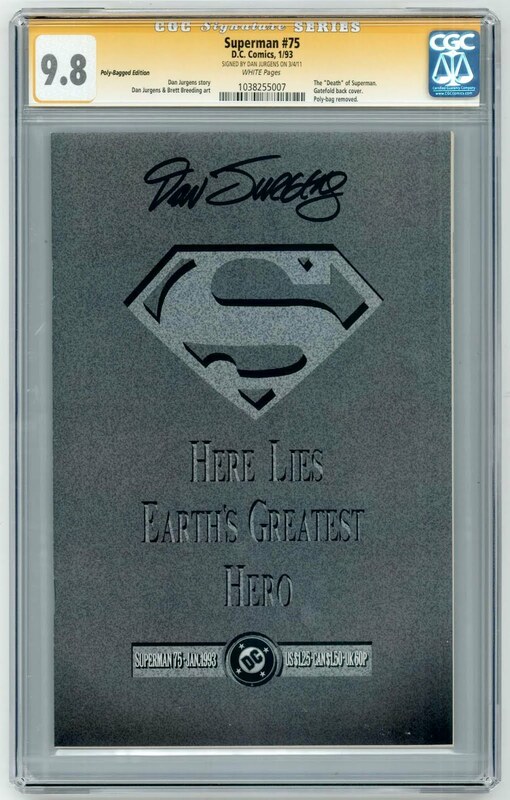 This set consisted of a memorial poster, a black armband, an obituary from the Daily Planet, a trading card and commemorative stamps. The next is the Platinum Edition. There were only 10,000 copies of the Platinum Edition produced. This comic didn't come with all of the extras that were in the black bag, but it is the most valuable of all the variants. 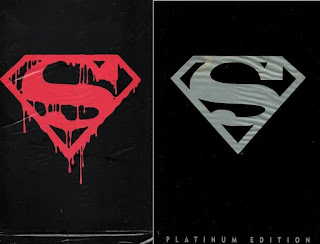 Just to let you know, if you have one of these polybagged editions and you want to have them graded, CGC and CBCS will remove the comics from the bag to grade them. There will be no graded copies that are still in the bag. So, if you had an artist or writer sign one of the bagged copies, that signature will most likely end up in the trash when you send it in for grading. Just a little knowledge for those that might not know how CGC / CBCS deal with bagged comics. I usually only talk about one cover when it comes to the CGC census, but today I'm going to go over two of them. The first is the first print direct edition. So far, there are 1,595 copies listed on the census. That may seem like a lot, but if you consider how many millions of copies that might be out there, that number isn't that high at all. Of course, with this comic being a 90's comic, there are a lot of high grades available. Of the 1,595 copies, 897 are a 9.8 NM/M. If you're looking to snag a copy, I would suggest not going below that grade. Recent sales for 9.8 NM/M copies of this issue haven't been spectacular, only selling in the $50 - $70 range. There was a boost in value shortly after BvS was released, with sales reaching over the $100 mark, but now that hype has faded, values are back down to where they were. The next cover is the Platinum Edition. Of the 10,000 produced, only 369 have been graded by CGC. Most of these are also high grade, with 101 copies graded at 9.8 NM/M and 103 graded at 9.6 NM+. This variant is by far the most collectible and most valuable. 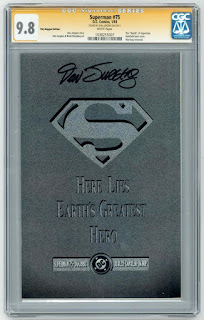 CGC 9.8 NM/M copies can easily go for over $300, and maybe even $400. Even 9.6 NM+ copies will probably still run you over $100. This here is a very affordable key issue comic. If you're a fan of Superman, this is probably a comic you should have in your collection. You won't have any problems finding a copy. You may even be able to find a raw copy in a bargain bin somewhere, but the grade might not be up to par for collectibility though. Either way, good luck on your hunt.